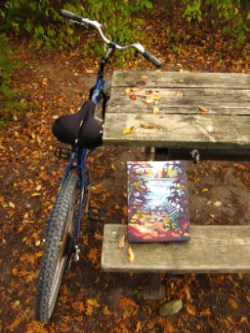 Sharon has been painting scenes on location as she travels by bike through Island lake Trail. Movement plays an integral role in Sharon’s creative process and using large brushes and palette knives enables her to work in an intuitive manner, giving energy to her work. She was recently awarded the Reed Cooper Bursary with a plan to study Studio Process Advancement in Haliburton and to continue painting the trail and give back to the area through special projects. Join her as she speaks about her work and her continuing journey at the Farmhouse Pottery Spring lecture series. Click below for direct link to book your space. This will also be a unique opportunity to preview her recent work for her upcoming show opening on Oct1st. New works never shown will be available for preview only.